I’m still in the “write what you know” phase of my career as an author. Which is to say, I’m plumbing my career as a harpist for all it’s worth. In Ellen the Harpist, readers get to peek behind the scenes at weddings from the perspective of a musician. In Ellen at Sea, I’ll take you below deck on a cruise ship, an experience I enjoyed while working aboard both the QE2 and the Seven Seas Navigator. I served on five short contracts ranging from four days to around three weeks. The same harpist who helped my mother find a harp teacher for me all of those years ago when I begged incessantly to start playing the harp recruited me to sign on for my first contract. The QE2 visited New York City on a regular schedule, making it easy for local harpists to get on and off the ship. My maritime career got off to a rough start. I was set to embark one Tuesday morning. I lived in Union City, NJ in an apartment with a spectacular view of the Hudson River and the New York skyline spanning from the Statue of Liberty up to the George Washington Bridge. The QE2 should have been in her berth in Manhattan across the river from me when I woke up that Tuesday. But her slip was empty. Overnight on Sunday, after having detoured to respond to another ship’s distress signal as she sailed off the coast of eastern Canada, and having navigated through tremendously rough seas churned up by a hurricane, she encountered a rogue wave measuring between 90-95’. I heard stories of furniture sliding across lounges as the ship listed. The harpist on board spent a scary night hunkered down in his cabin with his harp. The two of them, as well as all of the passengers and crew, made it through the night unharmed. The QE2 limped up the Hudson on Tuesday afternoon to seek harbor in NY overnight. I boarded her a day later, harp in tow. We didn’t set sail until late that night after the Coast Guard had approved her to be seaworthy. I will confess that, by the time we headed down the Hudson, I had acquired myself a boyfriend. That ship sailed out of my life between my second and third contracts. But he proved to be an excellent guide, helping me to navigate my first cruise. I began my contract with back-to-back transatlantic crossings. While the hurricane had run its course, the Atlantic Ocean retained some of its chop, making it the roughest of sailings I’ve experienced to date. I ensured my harp stayed upright when I wasn’t playing by securing it with a length of plastic wrap to a railing in an alcove near the Chart Room, the lounge where I played most of my sets. While I performed, the harp would list from one foot to another with the waves. I developed a technique of nudging it back into place with my knees. While playing a wedding a few hours after I had disembarked at the end of my contract, I instinctively bumped the harp with one knee or the other in a wavelike pattern, not yet trusting the harp to keep both of its feet on terra firma. In my limited career aboard cruise ships, I made six transatlantic crossings, two through the Panama Canal, and I visited ports including Madeira, Majorca, the Canary Islands, Cartagena, Columbia, and Caldera, Costa Rica. 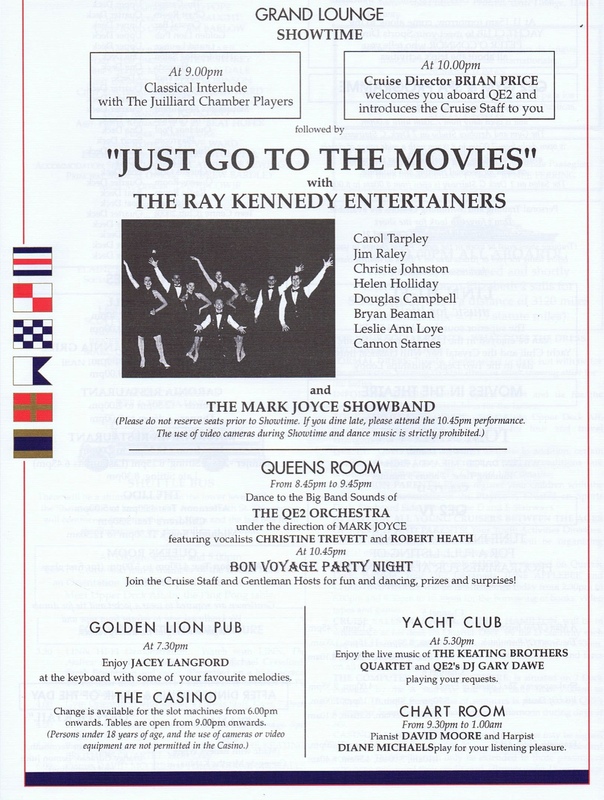 Aboard the QE2, I had guest status and wasn’t listed on the crew manifest, unlike when I was on the Navigator. On that ship, I had to pass a safety test before being allowed to disembark in any of the ports of call. Even as a crew member, I had very few non-harp responsibilities to fulfill. While working on either ship, I performed for three or four hours a day, which left me free to enjoy the ship and each port the rest of the time. It’s worth noting, for those of you who have never owned a camera not housed within a phone, once upon a time, cameras had film. We had to buy the film, wait until we finished a roll, pay to have it developed, and then wait again to see the pictures we had taken. I was very stingy with my camera, taking a distressingly limited number of pictures, most of which are completely meaningless to me today. You’ll just have to take my word for it: I saw some wonderful sights as I cruised. 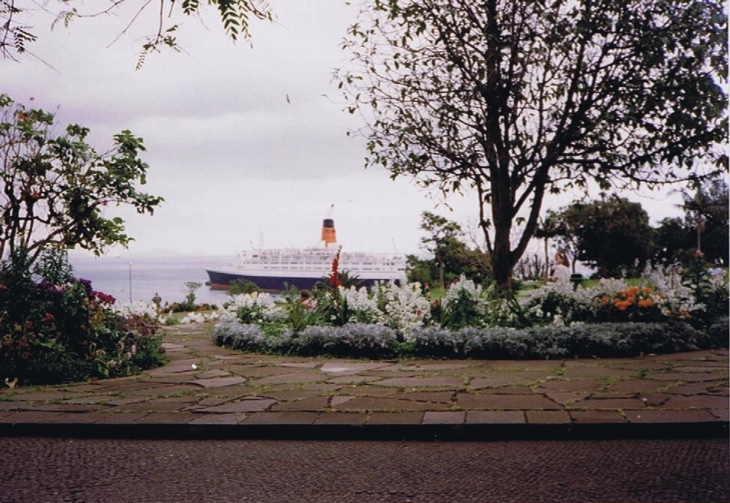 On the QE2, I lived in an inside cabin by myself on a passenger deck. The cabin was so tiny that, in order to bring the harp into it when I practiced, I had to remove the only moveable piece of furniture—a stool—and sit on the bed while I played. The Navigator was about six months old when I joined up. After receiving myriad complaints about the noise from the shows bleeding into the cabins above the show lounge, they stopped selling the cabins, instead housing select members of the staff (including the harpist) in them until they could address the sound insulation problem in their first refit. My stateroom was about three hundred square feet and came with a bathtub, walk-in closet, king-sized bed, and a balcony. It ruined me for all future cruises. When I took my book research cruise at the beginning of this year, I had to make do in a cabin with only a window. The horror! While my status as an entertainer allowed me to eat in passenger dining rooms, I typically ate in a staff dining room or in the officers mess. I do remember hitting the midnight buffet hard with the other entertainers on the QE2. After hours, we did most of our socializing in the Yacht Club with the passengers. I could drink in any lounge where I played, including the Queen’s Grill. But that wasn’t any fun because my colleagues couldn’t join me. Booze was cheap as can be for staff and crew, and drinking was highly encouraged. I recall the Music Director sitting me down (after my boyfriend had disembarked at the end of his contract) and telling me to drink more, especially if guests offered to buy me a drink while I was between sets in the Chart Room. Life aboard a cruise ship differs from line to line and according to rank. I had the good fortune to work as an entertainer on two pretty swank ships. From what I gather, life for crew members, including entertainers, is different today than the experiences I’ve described. There are more rules and less drinking with the passengers. I still think it’s an ideal opportunity for someone right out of college who isn’t ready to put down roots and who has a passion both for travel and for helping to make each voyage a special one for the passengers. It certainly left me with wonderful memories. I can’t wait for you to learn about Ellen’s cruise experience in Ellen at Sea!